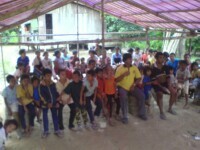 On 25th May 2001, a group of Orang Asli comprising both Temiar and Jahai from Kg. Bayor, Pos Pasik walked for 2 days to Kg Jadir. They have heard of us and they wanted to become Christians and also to be baptized. We baptized them in Sg. Lempai in Kg Jadir. By 2006, many of the villagers shifted to this side of the river and thus we relocated our bamboo church near Sungei Ayung. Up to date, a total of 530 inhabitants of Pos Pasik have been baptized but quite a number have left Post Pasik to work in other areas. Many of the older folks had gone home to be with the Lord. 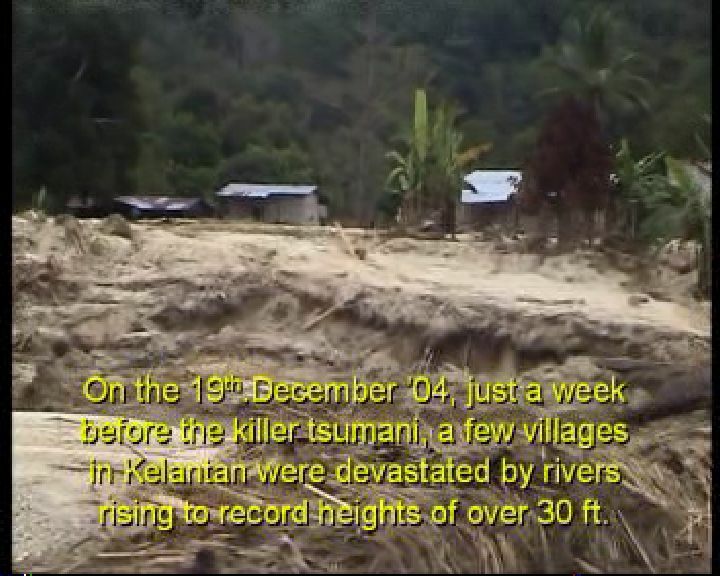 In the late afternoon of 19th December 2004, the Sungei Jenera overflowed the river bank up to a height of 30 feet above the normal water level of the river. Thus, the bamboo houses by the river were all washed away. Immediately, our church sent almost 10 tons of foodstuff, clothings, tents, etc. to all those affected in Pos Pasik. We thank God that not a single soul was lost and the material loss was minimal. 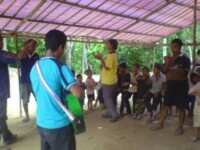 The down-turn in the economy of this country in 2008 benefited the Orang Asli nationwide. Up to date, more than 70% of them were provided with brick houses. 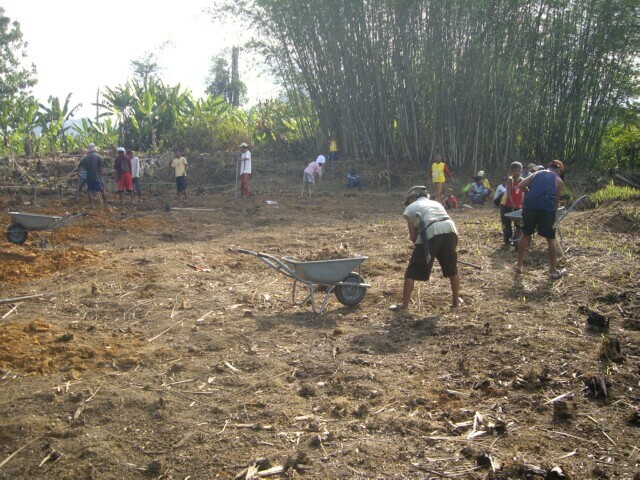 Recently, 3 blocks of agriculture plantations along the mud track were cultivated, resulting in the road being frequently maintained by tractors. Part of this road has been covered with stones. The journey from the main road at Meranto to Pasik is now more comfortable and the travelling time has been reduced to just over an hour. However, it is still only suitable for 4 wheel-drive vehicles. During rainy periods it is almost inaccessible. 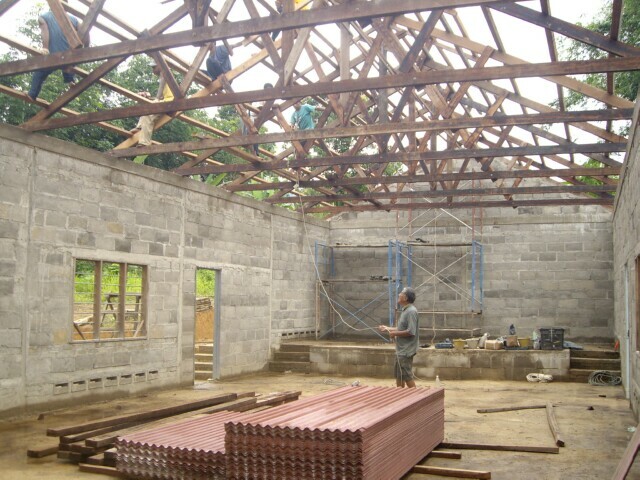 By late 2009, the Christians requested us to help them build a brick/concrete church since most of their houses are already made of brick. 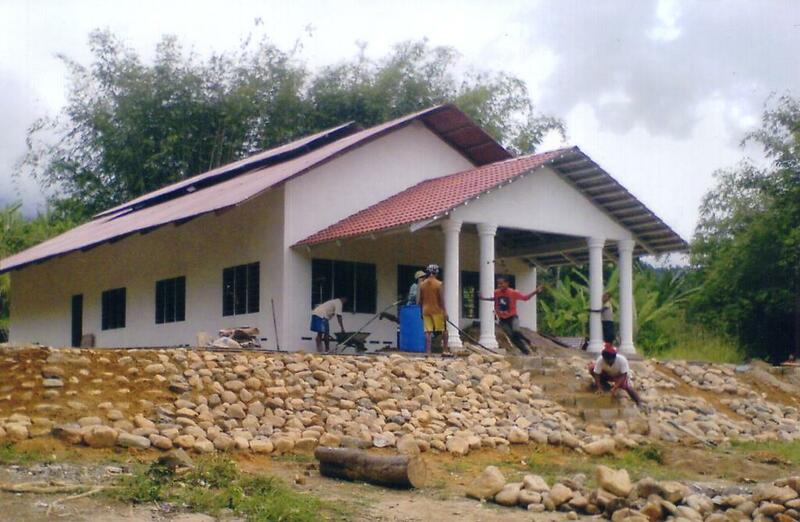 This is to replace the dilapidated bamboo church. 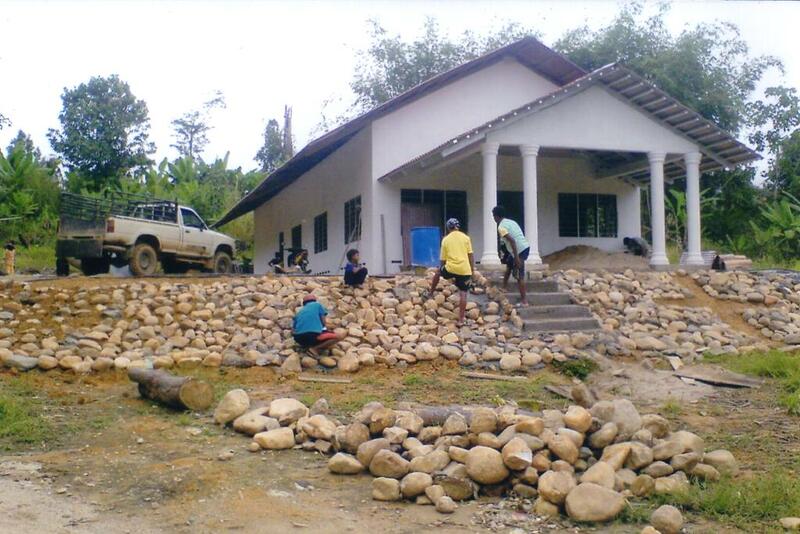 By April 2010, they started clearing the land of rubber trees belonging to brother Mior. At one of their meetings, it was decided that the headman should update JHEOA of the lastest development by informing them through the mail. 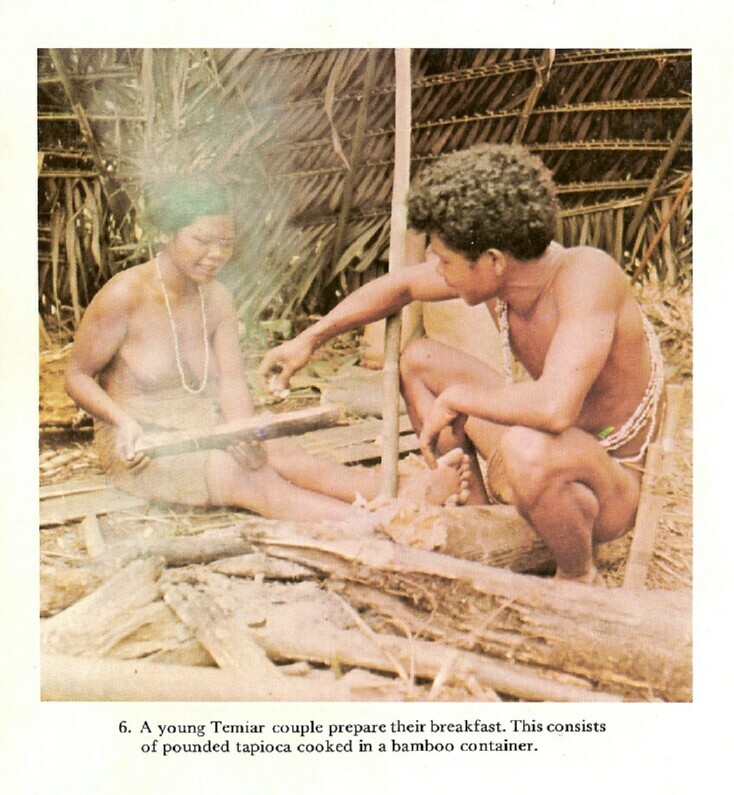 The land where brother Mior had planted his rubber trees was chosen by the villagers. He was so gracious to sacrifice the rubber trees planted there, especially when the price of rubber is so high. By May the land was cleared and ready for the building of the church. 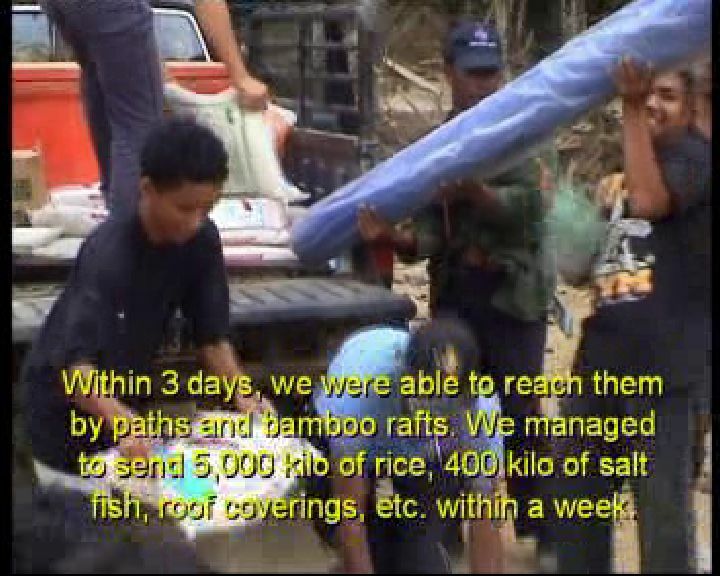 We managed to raise funds to provide the building materials, tools, foodstuff, etc. for the construction of this brick/concrete church. Delivery of building materials was made when there were no rain for the past 3 days. The plot of land was levelled for the construction of the church. We taught them to prepare the foundation, wood work, concrete work, steel work, etc. to build this church. All the labouring work was done by the Orang Asli themselves on a `gotong royong' (volunteers) basis and they are all from Pos Pasik. The bricking up of the walls took almost 2 months and was only completed by the end of July 2010. 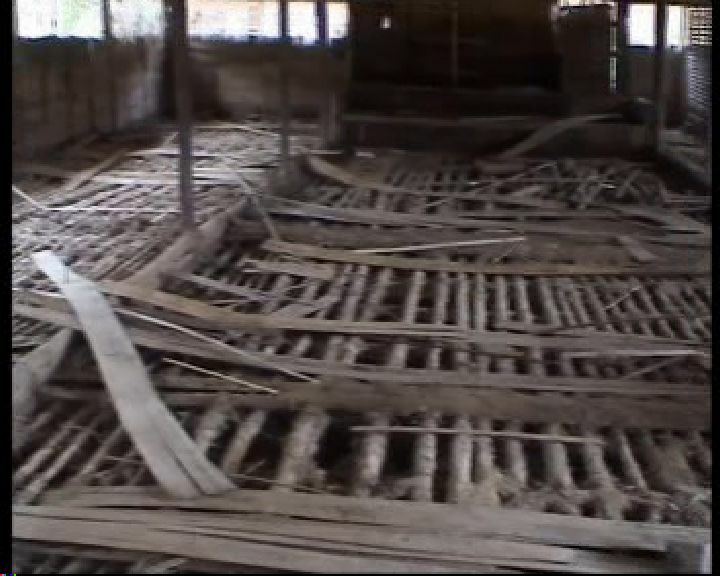 After that, they proceeded to prepare and concrete the roof beam. At the same time, the timber for the wooden roof thrusts were being cut to size. Villagers are ignoring the letter from JHEOA and building is still in progress. At this very moment, all structural work is being completed. They are now in the process of painting the whole building. Church building was used for a special night meeting on 26th September 2010. From this period of construction onwards, we had a lot of groups of uninvited visitors especially those from the religious bodies. They came and took pictures from various positions. It can be intimidating from the many visits especially from these religious bodies. For more than 3 years, the Orang Asli Christians in Kg Jias are worshipping God in this plastic tent while awaiting for the Court of Appeal. When is the Court of Appeal going to look into this case ? It is more than 3 years since the demolition of the church, how long more must the Christians suffer just to worship God ? 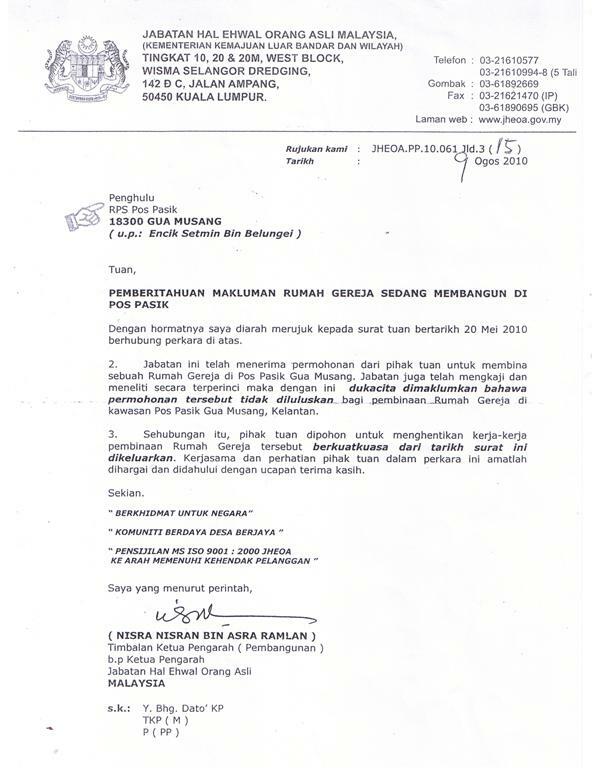 The Orang Asli villagers are ignoring this letter from JHEOA and will continue to build their house of worship for they fully-well know that this is one of their tricks in preventing Christians from worshipping God in a proper church building. The villagers will not stop work and thus treat this letter from JHEOA as null and void. JHEOA has abused its authority by releasing this letter of oppression. Unexpectedly on the 3rd of September 2010, Bro. Mior from Pos Pasik handed to us the letter from JHEOA dated 9th August 2010 addressed to Penghulu Setmen (which was only delivered to the headman's hand on 29th August 2010). This letter demanded the headman to stop all work relating to the construction of the church. This is outright an abuse of authority by the JHEOA, for the land use of OA land is strictly the power of the kampung headman and/or the decision of the villagers. In fact, as JHEOA, they should be supporting the construction of the church financially. The headman with the agreement of the Pos Pasik village leaders then appointed Mr. Lum Chee Seng to represent him as his lawyer to take all the neccessary actions. He is to reply to the letter dated 5th August 2010 from JHEOA and also to write to the MB of Kelantan, the MP of Gua Musang, and others informing them of this abuse of authority on the part of JHEOA. On the 13th. August, the lawyer replied the JHEOA's letter and forwarded the letter to both the Menteri Besar of Kelantan and the Member of Palaiment of Gua Musang Tungku Razali. the immediate stoppage of all construction. 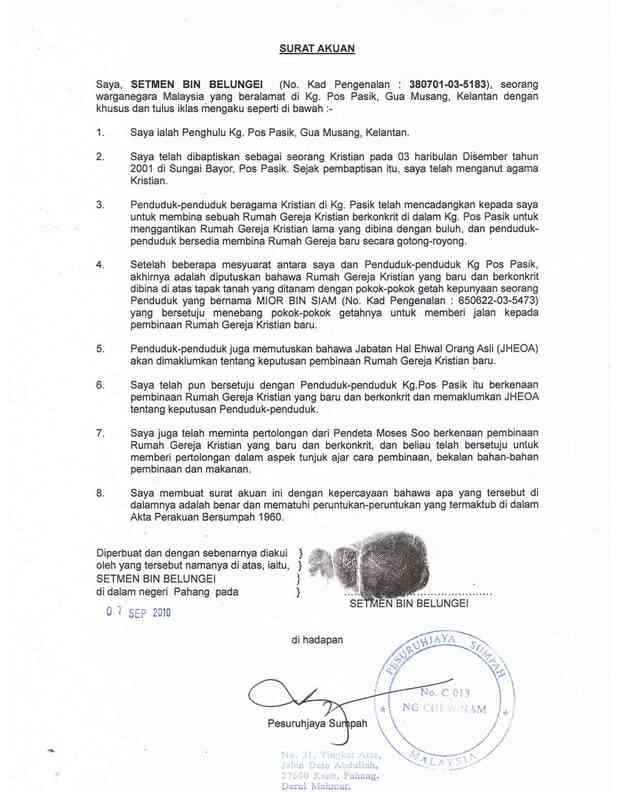 The Department that looks after the welfare of the Aborigines (JHEOA), unreasonably and illegally, issued a letter on the 9th August 2010, demanding the headman of Pos Pasik to stop the construction of the church building which is located deep in the Malaysian jungle. This letter reached the headman only on the 29th August 2010. God has provided a hugh tree (merbau-high quality wood), which had fallen into the river many years ago and had never been retrieved by anyone. Thus, we obtain the timber for the roofing from this fallen log. By June, all the concreting of the floors were completed. Building of the brick walls was in progress. The door and window frames were also installed. Immediately, a bamboo church was set up in Kg. Pasik on the other side of the river to cater for the needs of the new Christians. Teachers were sent in to help to enlighten the new converts. Weekly worship services were held there. The late Penghulu Chimbong was the overall headman with Penghulu Setmen taking charge of Kg Bayor. The inhabitants were all Animists. Pos Pasik is situated deep in the Malaysian jungle at the foot of the Eastern slope of Titiwangsa (Central Range) and is about 70 kilometre North of Gua Musang. It covers a large area comprising of many Orang Asli villages including Kg Pasik, Kg Ayung, Kg Bayor, Kg Serai. 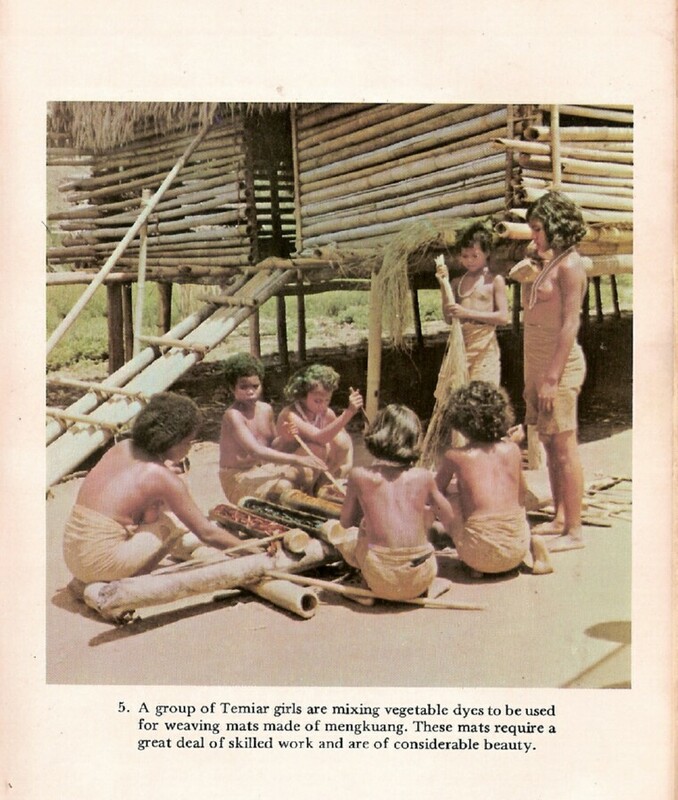 The Orang Asli here are of the Temiar tribe with a few being Jahai. It is situated on both sides of Sungei Jenera, with a population of over 600 souls (inclusive of children). In 2005, only a disused muddy logging track led from Meranto (main road) to Pos Pasik. Pos Pasik was only reachable in a proper 4 wheel-drive vehicle and takes about 2-3 hours of travelling time. The steel bridge spanning the river was also washed away. This bridge has never been replaced. The villagers had to wade across the river which normally is less than 2 feet deep. Our church was located beyond the river and our pastor had to cross the river for the weekly worship service. 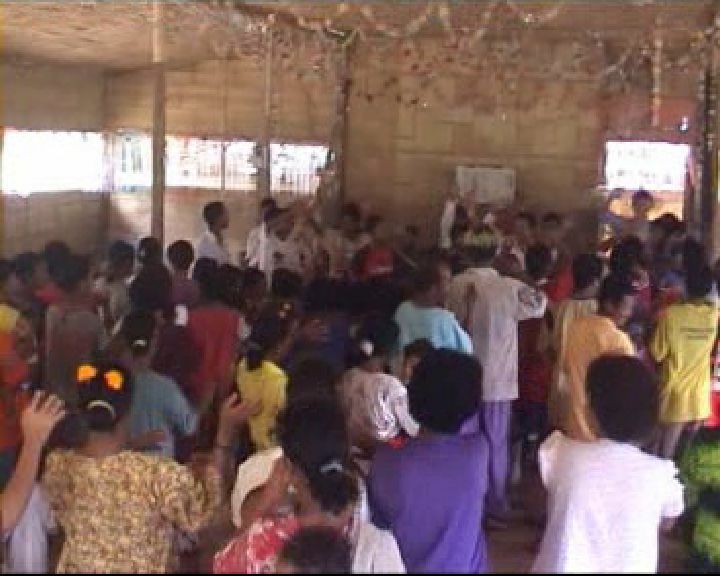 On 3rd of December 2001 alone, 297 inhabitants of Pos Pasik were baptized by families into the Body of Christ. They were from Kg Bayor, Kg Pasik, and Kg. Serai. The two Penghulu were also baptized. 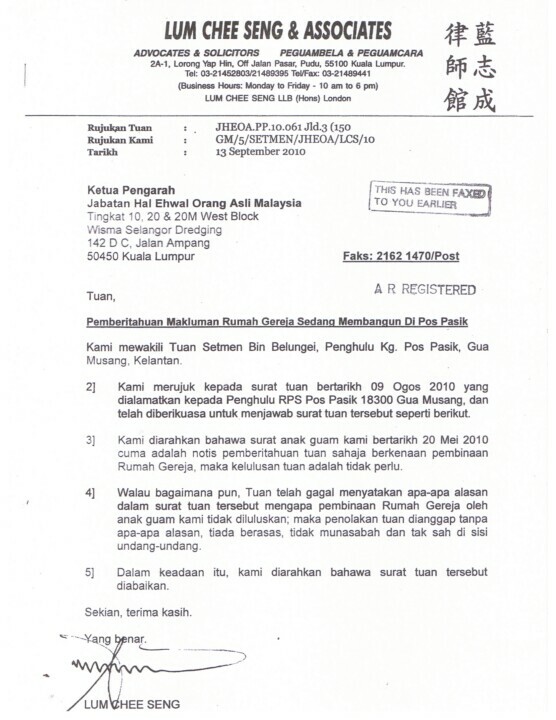 Both, the Headman Penghulu Setmen of Pos Pasik and his lawyer, have received letters (dated 26th September 2010) from the Menteri Besar's Office, requesting the Land Office of Gua Musang to look into this issue. We are stiil awaiting to hear from the Land Office. God's faithfulness - A rainbow was seen on this Day of Independence, stretching for one kilometre from the entrance of the old bamboo church to the entrance of the new church that is being built. On the 29th August, the headman received a letter from JHEOA demanding the construction of the church to be stopped immediately. Within 2 days (i.e. 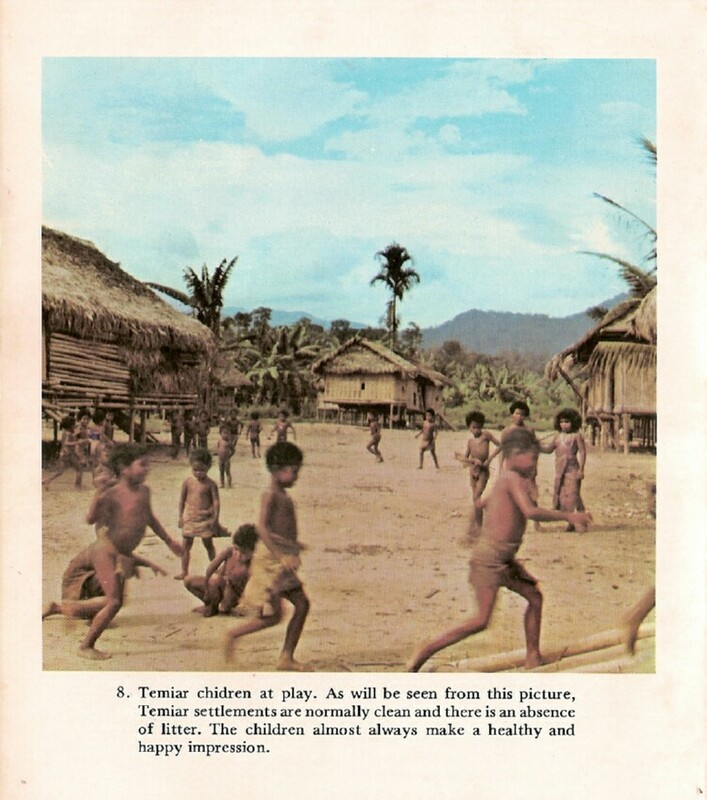 on Merdeka Day or Day of Independence of Malaya) the rainbow was clearly seen but the villagers of Pos Pasik showing that the Almighty God is in control of the situation. Is God telling the Orang Asli that He will set them free (Day of Independence) from the oppression of the abusers of authority ? God's faithfulness - Again, a rainbow was seen on this Day of Malaysia, stretching for one kilometre from the entrance of the old church to the entrance of the new church. Is this the confimation that God will set the Orang Asli free from their oppressors and that they will have their rights over their own land? And that they will also have their freedom of worship and religion and no longer being treated as backward, lazy and beggars, but as fellow-citizens working for the betterment and success of Malaysia, and be able to share the prosperity of the nation. With God, nothing is impossible. Amen. 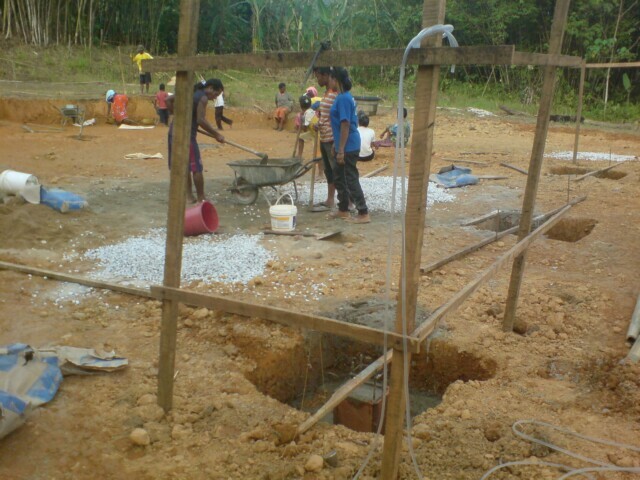 The construction of the church is in the final stage. The floor tiles were completed on the 27th October, and the final coat of paint is completed. By the beginning of November, the fixing of the windows/glass and doors will be completed and then awaits the dedication. The Church is completed and we held our Christmas celebration there, hallelujah. However, our brethren in Kg Jias are still worshippinng under a tent even though the court had awarded them the damages of the illegal demolition of the church by the local authority since 15th July 2009. The appeal by the D.O. 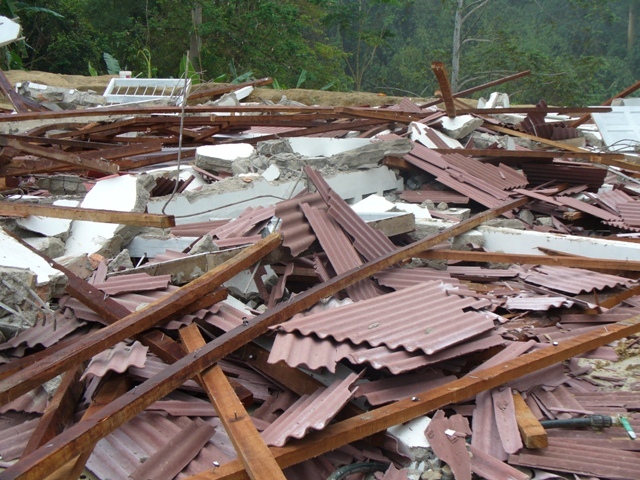 of Gua Musang to the court of appeal had delayed and prevented the rebuilding the church. How long more have we to tolerate this unjust and demonic oppression ?